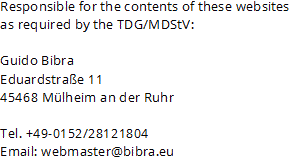 The best way to contact me is to write an email to webmaster@bibra.eu. Because of the high volume of spam in my inbox, it is possible that I delete mails accidentially or they are caught by the spam filter. Any email to me should be marked in the subject in a way that it can be clearly identified as non-spam. If I do not react to an email in 3-4 days, it is possible that it was accidentially deleted or caught by the spam filter. In that case, please resend the mail with a different subject line.